23 Just then a man in their synagogue who was possessed by an impure spirit cried out, 24 “What do you want with us, Jesus of Nazareth? Have you come to destroy us? I know who you are—the Holy One of God!” 25 “Be quiet!” said Jesus sternly. “Come out of him!” 26 The impure spirit shook the man violently and came out of him with a shriek. 27 The people were all so amazed that they asked each other, “What is this? A new teaching—and with authority! He even gives orders to impure spirits and they obey him.” 28 News about him spread quickly over the whole region of Galilee. Jesus taught people by words, but He also healed people’s sickness and restored the demon-possessed. He wants us to worship God wholly by our mind, spirit and body. Let us not focus disproportionately on one of them. 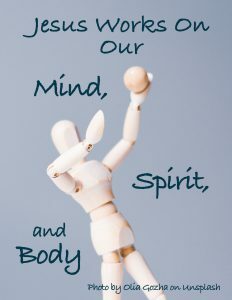 Our heart and body, our mind and spirit are all given by God. They all work healthily in the Kingdom of God. 1) Do you think you focus too much on either your mind or spirit? 2) Why are there people whose sickness are healed and those who aren’t healed?